Working with children lights up my life. They energize me and fill me with such joy. I love watching them grow and become independent learners. I love how curious about the world they are and it sparks that child-like wonder in me. I have my Early Childhood Development Credential, and I am CPR & First Aid Certified. I’m working towards my BS in child development. I’ve been caring for and teaching children since 2001. I was born and raised in Reseda, moved to Maine for 9 years and relocated back to the Valley. I am an auntie to 4 beautiful nieces and nephews. I have a background in art, and love to create. I’m always looking for new ways to express my creativity. I love music, concerts and traveling. I’ve driven across the country 5 times! 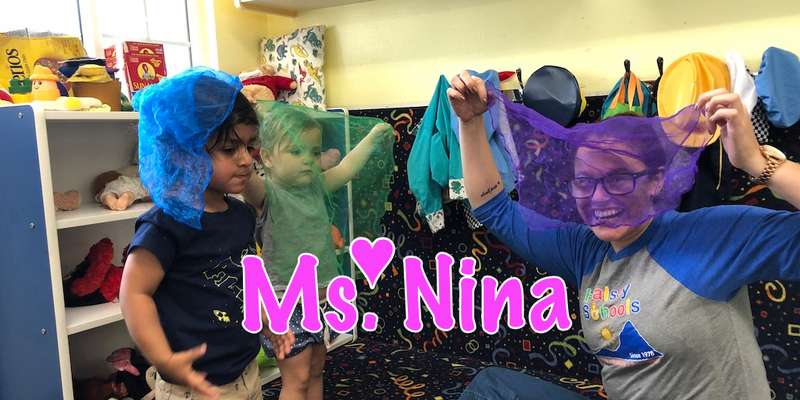 Ms. Nina works primarily with our Infants, Tiny Tots and Toddlers. However, just like all our teachers, you’ll find her in all our classrooms. Her anniversary date is July 16, 2018.